"For me, just being able to sit in the same room with my family is immensely rewarding, something I was not certain I would ever have the opportunity to do again"
In this Tuesday, Nov. 20, 2018, photo, a makeshift memorial of flowers rests on bushes outside the Tree of Life Synagogue in Pittsburgh. Mass shootings, hurricanes, fires - for many people across the nation, 2018 was a year of loss unlike any other. As the quintessentially American holiday of Thanksgiving approaches, some will abandon traditions or chose not to mark the holiday at all. Others will celebrate new friendships forged in the wake of tragedy. Mass shootings, hurricanes, fires — for many people across the nation, 2018 was a year of loss unlike any other. As the quintessentially American holiday of Thanksgiving approaches, some will abandon traditions or choose not to mark the holiday at all. Others will celebrate new friendships forged in the wake of tragedy. PARKLAND, FLORIDA: "A HARD WEEK"
Fred Guttenberg will start his Thanksgiving morning at a cemetery. His 14-year-old daughter, Jaime, was one of 17 people killed in the Valentine's Day massacre at Marjory Stoneman Douglas High School. "This Thanksgiving is about loss," said Guttenberg who will visit Jaime's grave with his wife, his son and their two dogs. "It's my first Thanksgiving without my daughter, and we're not going to leave her out of it." After that, the family has no plans to celebrate or eat a turkey dinner. None of their past traditions seems appropriate. Jaime loved the holidays, her dad said. She looked forward to decorating the house and helping her mom with the cooking. "This is going to be a hard week," Guttenberg said in a phone interview. He's been a vocal advocate for stricter gun laws and started Orange Ribbons For Jaime, an organization that raises money for gun reform and for causes that were important to his daughter, including animal welfare and dance scholarships. The grieving father made national headlines when he was one of the first parents to speak out after the shooting at a candlelight vigil. During his gut-wrenching recap of his last moments with Jaime, he worried whether he had remembered to say "I love you" as she rushed out the door for school. "I sent her to school yesterday. She was supposed to be safe. My job is to protect my children," he told the crowd. Now, nine months later, Guttenberg says his family is facing a season of firsts without Jaime, whom he described as the energy in the room. He had a request for families who have not lost any loved ones to gun violence. "Remember those who maybe aren't there this holiday and be part of the change that needs to happen in this country so it doesn't happen to them next." 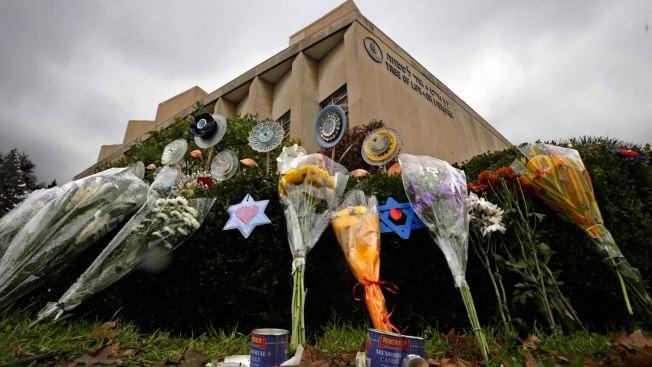 PITTSBURGH: "WE MUST NOT FORGET"
Rabbi Jeffrey Myers had just begun Shabbat service at the Tree of Life synagogue in Pittsburgh when the shooting began. Now, less than three weeks after the deadliest attack on Jews in the United States, he plans to celebrate Thanksgiving and encouraged others to do so too. "People are looking forward to Thanksgiving because there is a lot to be thankful for," he said. The day of the attack, Oct. 27, "will remain a constant wound," Myers said of the shooting that killed 11 people. But in his weekly blog post to his congregants, he wrote: "For me, just being able to sit in the same room with my family is immensely rewarding, something I was not certain I would ever have the opportunity to do again. That is why something so simple is so powerful and meaningful for me." However, that is not enough, Myers said. He urged people to be aware of the less fortunate, those in the community who need food and shelter. And he suggested "one simple, yet meaningful gesture" that would make an impact. He asked people to count the number of friends and relatives gathered around their tables at Thanksgiving and donate that sum to charities that feed the hungry. People could also give more, or less. "It is called tzedakah for an excellent reason: The root word, tzedek, means 'righteousness.' It is the right thing to do, and you know that. The needs of others did not disappear on Oct. 27. They remained, and we must not forget them." Athenia Dunham and daughter Natalie will spend Thanksgiving at the home of a woman they met less than two weeks ago, surrounded by new friends. Athenia call them "angels." The Dunhams barely escaped their home in Paradise, California, on Nov. 8 as a deadly wildfire swept through. They were awoken by their pitbull, Luna, and flames were already burning the home next door. They made it out and to a hotel in nearby Redding, paying for the room with money from a homeowner's insurance payout. On a normal Thanksgiving, Athenia said, she would be cooking for a few friends and preparing to "pig out and veg." But this year the holidays are the last thing on her mind. "To be honest, I really don't even know what day it is — it feels like this just happened yesterday," she said Tuesday. But an army of super volunteers who connected via Facebook have come together to help give the two women as normal a Thanksgiving as possible. Beyond providing a meal, the volunteers have provided the mother and daughter with clothing, gift cards and a laptop computer so Natalie can keep up with her education. One volunteer even did their laundry. "They're our angels — and angels have been with us since we left our driveway," Athenia said. The Rev. Eddie LaFountain of the First Baptist Church in Mexico Beach, Florida, plans to welcome 300 people to the parking lot of his storm-damaged church for Thanksgiving dinner. He's held worship services in the lot since Hurricane Michael destroyed most of the community on Oct. 10. Since that Category 4 storm, the church has become one of the town's hubs for supplies, necessities and love. Thanksgiving Day is no different, LaFountain said. "We just felt like we wanted to open it up to everybody that's here. Because some don't have ovens, some are here volunteering. Anybody's invited," he said. "Just to be thankful that God's given us life." LaFountain's other job as a landscaper dried up since the hurricane, as did his wife's job cleaning condos. But he feels blessed that his apartment was unscathed, his children are safe and that he has firsthand evidence of the good in people every day. Just a few days ago, volunteers put a new roof on the church. Inside, the donations of shoes, groceries, clothing and other items are free for the taking. "We can barely walk through the church sometimes," he said. Volunteers from Wild Olive, a Panama City restaurant, are cooking the Thanksgiving meal for the hundreds expected to stop by. "We're going to pray with them and love on them," LaFountain said. "If you ever want to experience God, he's here." Associated Press writers Kelli Kennedy, Ramesh Santanam and Kathleen Ronayne contributed to this report.